In the past week I have been asked a countless number of times how to install GCC ( GNU Compiler Collection ). I have been using it in my C Video Tutorial. 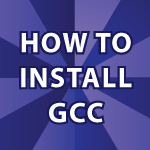 I show you how to install GCC on Windows as well as on a Mac in the video below. Not only did I make a video, but I also have everything listed step-by-step below after the video. If you have any trouble setting this up, leave a comment below and I’ll try to help. 1. Go to MacPorts and install it by downloading the DMG and installing it. Make sure you pick the right version based on your operating system version. If you see version 4.8 in what follows, congratulations you have the updated version of GCC and you are ready to start writing C11 programs. I had a different gcc version installed many months ago. Could this be why I’m not getting the version 4.8 after following all of these steps on my Macbook Pro? That could be. Make sure you point forward the right version in your path and that should fix it. “port help” or “man 1 port” for more information. Can you offer any help? I’ve run into the same issue. Did you manage to solve it? However, I am installing on windows and it seems to all have worked ..except the ending and checking. my problem is… you click on a “testing” doc? which I assume you made some lil code in notepad earlier and saved it there .. I made one called “motto.cpp” in notepad but when I try to do your last step of typing in “gcc motto.cpp” I get an error message. please help me if you can???? so confused whats going wrong?